Oops! Don't mind the wrinkles, I took this photo after an afternoon of sitting in the truck running errands! Oh wow, look! A sewing project that isn't a knitting project bag! Crazy, I know! I'm sure a lot of you are pretty relieved to not have to see another bag. This dress was my last FO of 2010, and was sewn at the beginning of December but couldn't blog about it 'til now cause I just couldn't get any photos taken of it. I knew that I wasn't going to get any knitting projects completed before the year was over but had thought why not end the year with a bang by sewing an actual garment? 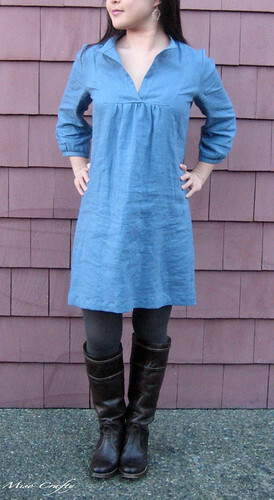 This here is a Tova dress, sewn from a Wiksten limited edition hand-drawn sewing pattern. I've been in love with this dress since 2008, when I first laid eyes on the dress when Jenny first wore it on her blog. Then this version appeared a few months later and was to be on sale in her shop that spring. She was a one-woman show at the time and couldn't keep her shop stocked because her pieces would always sell out within a matter of hours, sometimes minutes! Even enlisting the help of an intern hasn't allowed her online shop to stay stocked with even one item. Not that it would matter anyways cause I wouldn't have been able to afford one of her lovely creations, now that my disposable income is no more and has become the Munchkin's diaper fund. The dress was a very easy sew and came with thorough step-by-step instructions accompanied by photos for each step. Definitely a great pattern for a beginner who is ready for something a little more challenging. Brett was perplexed as to why I would buy such a pricey pattern for such a simple design, especially when I could have drafted the pattern myself. Well, true...I could have drafted the pattern but I would have felt extremely guilty for copying a self-published, independent designer's work. I love this dress to bits and would like to give the credit where credit is due while supporting an indie designer. I had to explain to Brett that the reason why the pattern was costly was because it was hand-drawn, then taken to a copy centre before each copy was folded by hand by the designer herself, then packaged and labeled...all in such a short amount of time and the whole process completed by a mere 2 peeps. All in all it had a lot to do with ethics and morals...and maybe, as a sewist and crafter myself, understanding just how much time and effort goes into producing such an item. Anyhoo, back to the dress. I wasn't quite sure what type of fabric I wanted to use, and whether o not if I wanted a print or a solid fabric. So to help me decide I opted to shop within my fabric stash. I have had this blue fabric for a few years now, the post-it note containing the fabric's info was long gone. All I knew about it was that I had purchased it at Fabricana and that it was a linen blend of sorts. After a quick burn test I confirmed that the fabric was indeed linen, mixed with a tiny bit of viscose or rayon. I'm betting that it is a linen/bamboo blend, solely because I remember being full of glee as I laid eyes on the variety of sustainable fabrics that Fabricana was carrying at the time. It took me 3 days to sew up the dress cause I only had the Munchkin's nap time to work on it. 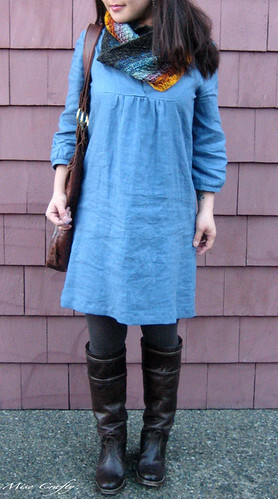 So far the dress is great as a layering piece for the colder weather and will be fabulous and airy in warmer weather. When I first tried on the dress Brett immediately called it my "19 kids and counting Amish dress". He really thought it was too roomy and a bit too conservative compared to the rest of the dresses in my wardrobe. I, on the other hand, am happy with how the dressed turned out and plan on making another as well as a shirt version sometime soon. The only things I would change the next time 'round would be to shorten the sleeves a tad and maybe sew the extra-small size for the shirt in hopes that it will cut down the ease in the bust area. I think it looks great! I love the colour you chose. It reminds me of the schoolhouse tunic pattern that I own. I really should make that up sometime soon. I want to ask a favour of you. You don't know me but I've tried and tried to buy a tova pattern from Jenny's website and never been successful (despite always being logged in as soon as the patterns go on sale). I love the Tova dress and have wanted to make one for years now. Would you be willing to let me borrow your pattern? Jenny put extra patterns for sale and I got one. Woo hoo! So no need to consider lending yours to me. See ya!